When I was very young, the stoplights in the city were different than today. Back then they were only red and green, with no yellow light in between. Instead of yellow, when the green was changing to red, the red would come on with the green, letting drivers know it was about to be red only. In the grocery store you can get a “stoplight” package of one each - red, yellow and green pepper. The three colours together remind you of the stoplight and are really very appealing to the eye. Okay, great, but what does that have to do with the price of tea in China? Well, I was thinking about the “stoplight” package and the old traffic lights after I made a Thai red curry recently. My BW loves those very wide green beans, the ones called Kentucky wonder or Italian beans. I decided to try a curry with them, and use a red- curry paste base. The first preparation was good enough for seconds and then I thought about adding tofu to boost the protein. What follows is a great curry, featuring green beans in a red sauce; a red, green bean curry. It’s not surreal; it’s surprisingly special in a simple, straightforward way. Pour the coconut milk into a medium saucepan. Turn heat to high. When beans come to the boil, lower heat to a simmer and add the browned tofu. Stir the pot and add the mushrooms if using. Simmer the pot for 5 minutes then taste- check beans for doneness. When beans are tender to your taste, they are ready to serve. The curry should have a warm, reddish colour. I didn’t, but you could fry the raw beans in oil and then add to the coconut milk. You could skip the mushrooms and tofu and this will still remain a lovely green bean dish. But, if you have them, use them. So, if you’re bored with green beans but still have plenty in your freezer, stop and go try this preparation, it will revive your interest in them. Curry...GREAT going in. Not so much coming out. But, I'll worry about that later. I've never had curry--I would like to try it sometime, though. Al: Are you trying to curry favour here? Either way it's great. The Golden Eagle: Once you try it, a whole new exciting tasty world opens up. I am guessing this tasted WOW! Thai food is always appealing to us -This curry looks authentic and yummy! Torviewtoronto: I agree with you, we love this particular dish. Now Serving: It is authentic (by me anyway) and yummy; but also scrumptious. Hope you'll try it soon. This looks delicious, I'd love to mop it up with a piece of Indian roti...! Lynda R Young: I love curries anytime. You say it's winter there in Oz; do you know the wizard? Plateful: Oh yeah you're right, roti best way to mop up this lovely sauce, although I usually serve it atop steamed rice, and savour each gravy drenched grain. I like the way you write a little human interest first and then tie it into your cooking. I like the story about the lights. I grew up in a town without traffic lights. I can't even remember when I saw my first traffic light. Love your recipe. 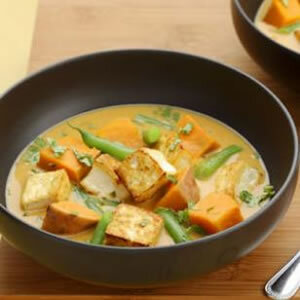 Yumm curry and tofu and coconut milk. All my favorites. Manzanita: They had so many traffic lights there that the system was synchronized. If you drove at the speed limit each light would be green as you approached it. I'm happy you like this recipe, at first I was going to call it stop-go curry. But I appreciate your comments. Oh this looks really good. It isn't often enough that I make a curry. And you know I love to think of food in complimentary color combinations. :) Nice post! this designer cooks: I agree. Food should at first look good. Thank You. love red curries..look so so yumm!!! Sarah: Yes, red curries are good. Other vegetables can be substituted for the green beans in this recipe. Thank You, I appreciate your comments. GABRIELLE: Thank You, I appreciate that.